Notes for Rotational Motion chapter of class 11 physics. Dronstudy provides free comprehensive chapterwise class 11 physics notes with proper images & diagram. In a system of extended bodies there is one special point that has some interesting and simple properties no matter how complicated the system is. This point is called the center of mass. where is the total mass of the system. 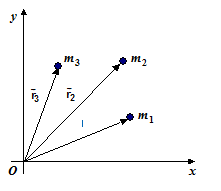 The location of the centre of mass is independent of the reference frame used to locate it. The centre of mass of the system of particles depends only on the masses of the particles and the positions of the particles relative to one another. where is the position vector of the centre of mass of a small mass element dm. Often we deal with homogeneous objects having a point, a line, or a plane of symmetry. Then the centre of mass will lie at the point, on the line, or in the plane of symmetry. For example, the centre of mass of a homogeneous rod will lie at the centre of the rod, the centre of mass of a homogenous sphere will be at the centre of the sphere, the centre of mass of a cone will be at the axis of the cone, etc. Find the center of mass of a uniform semicircular rod of radius R.
From the symmetry of the body we see at once that the centre of mass must lie along the y axis, so xcm = 0. Its y coordinate is . where is the velocity of the first particle, etc., and is the velocity of the centre of mass. This states that the centre of mass of a system of particles moves as though all the mass of the system is concentrated at the centre of mass and all the external forces were applied at that point. One important situation is that in which then = constant. A dog of mass 10 kg stands on a stationary boat of mass 40 kg so that he is 20 m from the shore. He then walks 8 m on the boat towards the shore and halts. How far is he from the shore now? Assume that there is no friction between the boat and water. In the horizontal direction, there is no force on the system (dog + boat). Therefore, the centre of mass of the system does not move in the horizontal direction. Since the dog moves towards the shore, the boat moves away from the shore to keep centre of mass stationary. Let d be the distance by which the boat moves backwards and let x be the initial distance of the boat from the shore. The dog is 20 – 8 + = 13.6 m from the shore. 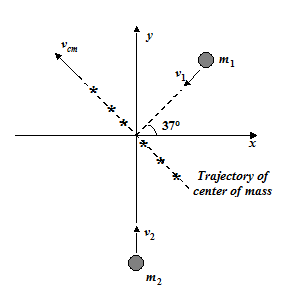 Two balls with masses m1 = 3 kg and m2 = 5 kg have initial velocities v1 = v2 = 5 m/s in the directions as shown in the figure. They collide at the origin. (a) The given time is of no consequence since vcm is constant for all times. Initially the man, the platform, and the cm have the same velocity, 4m/s. When he begins to walk forward, his increase in momentum must be compensated by a decrease in the platform's momentum. 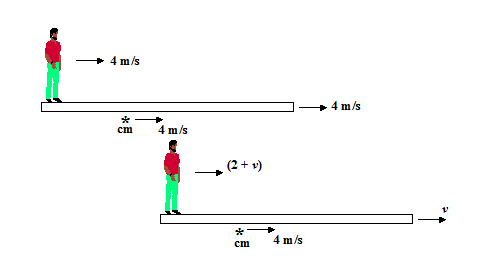 Let us say that the velocity of the platform relative to the ground while he is walking i.e. is vm = 4.5 m/s. Since the velocity of man relative to platform is 2m/s, therefore, it takes for him to walk from the rear to the front.